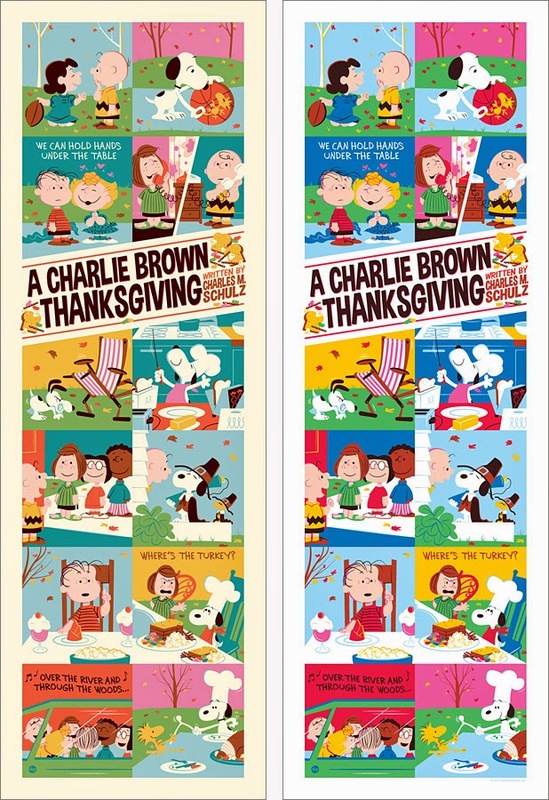 Thanksgiving is approaching and Peanuts fans can celebrate with another helping of lovely limited edition prints from Dark Hall Mansion. 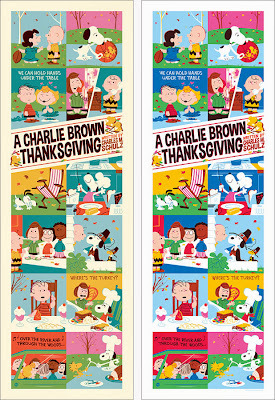 The 2013 print commemorating A Charlie Brown Thanksgiving tells the story of the well-loved 1973 television special in an eye-catching vertical layout of 12 panels. Think of your favorite moment from the show, and it's here in the print! This is the second in a series of matching prints by Dave Perillo - standard versions of last month's It's the Great Pumpkin, Charlie Brown are still available from Dark Hall Mansion, and next month will see the release of a new Charlie Brown Christmas print. As with previous Dark Hall Mansion releases, there will be two versions of the Thanksgiving print: a standard version and a variant version with more vivid colors. Both editions are 12" x 36", individually screen printed, and numbered to reflect their limited quantities. The standard edition is limited to 280 prints, and the variant is limited to 50 prints. In addition, there will be a special run of 10 of each style printed on 12″ x 36″ panels of wood. All editions go on sale Friday, November 15, 2013 at a random time between 9:30 AM and 11:30 AM Pacific time at Dark Hall Mansion's webstore. For more information and for larger pictures of each poster, visit Dark Hall Mansion's blog or their Facebook page.